i knew it's been a bit since i put up a sepia saturday photo - but really january! we aren't kidding when we say time flies! today's photo was taken at some unknown gathering in the front yard of my maternal grandparents' home in harwood mines, pennsylvania. 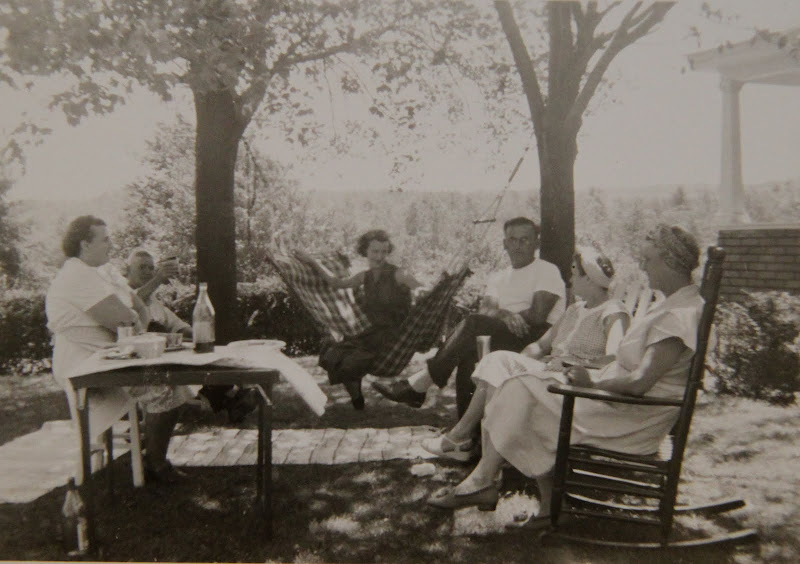 i'm not sure when it was taken, based on aunt rose, the woman on the hammock, i expect it was taken during the early 1950s or maybe even the late 1940s. i'm pretty certain the man sitting with his legs crossed is uncle andy, rose's husband - they married in 1951. whether they were married when the photo was snapped, who knows. my grandmother (nana) is the woman seated at the table next to the man with glass raised. i don't know the identity of the others in the photo - relatives? neighbors? other than location, and these three people i can only speculate the story of the photo. perhaps this picture was taken when rose and andy announced their engagement, surely it must have been some special occasion for someone to have gone through the trouble of finding a camera to document this moment in time. today cameras are ubiquitous and some of us document everything (that would be me), but 50-60 years ago this wasn't the case -especially from what i know of my mother's family, unless there is an closeted shutterbug that i don't know about! in addition to seeing a youthful nana, aunt rose and uncle andy, what is amazing for me about this photo is the background. i know the exact spot where the unknown photographer stood. if one stood in that spot in the 1960s - 1990s and glanced out at the hills, it would not be trees one would see but raw and wounded earth that was strip mined starting in the late 50s. 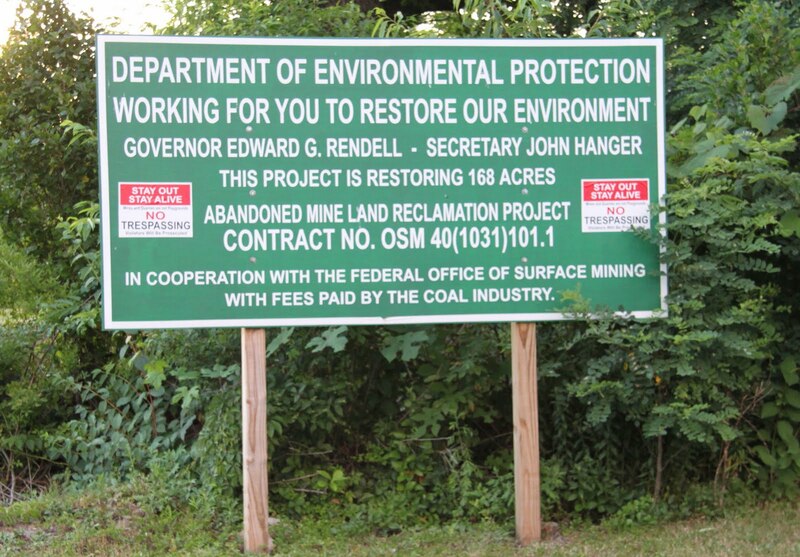 today the landscape is slowly coming back with the help of hard-fought for reclamation programs, but the wounds are still there. addendum made at 4:15 pm: i just spoke with my mother and she was a font of knowledge about the old photo. turns out the gentleman i thought was my uncle andy isn't uncle andy, but a visiting relative from indiana. the man seated next to nana is my great-grandfather's brother who coincidentally is named andy - so there is an uncle andy in the photo, just not the uncle andy i thought! if he's my great-grandfather's brother i guess he'd be my great-great-uncle andy. the two women with scarves are among the indiana contingent - my mom didn't know the names of any other indiana people other than andy. we did narrow it down to the late 1940s and speculate that the bottles may be wine or soda pop. they definitely aren't the shape of beer or whiskey bottles. mom also said the photographer must be someone from indiana and confirmed my impression that there weren't really any shutterbugs among her immediate family. addendum 5:15: speaking of uncle andy - i was just thinking of my conversation with my mom and about uncle andy and started thinking about a couple wonderful books i have on hand for visiting children at casa mouse. a head's up's to all those aficionados of kiddie lit and/or (uncle) andy warhol. the books are by james warhola. james warhola is andy warhol's nephew and an artist in his own right. the first book is called uncle andy's: a faabbbulous visit with andy warhol (2003). 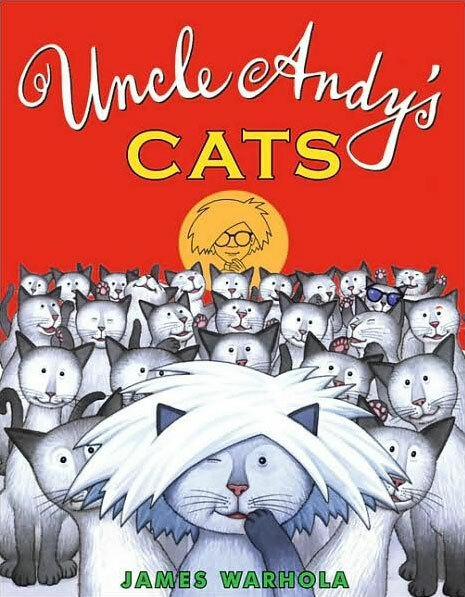 james followed this book up a few years later with an equally delightful and fabulous book entitled uncle andy's cats, the cover of which is seen to your right. I like this picture...it reminds me of simple times...when just sitting together and visiting was a treasured pastime. I have a few photos similar to this. Love how the ladies would wear scarves wrapped over their hair pins. Pincurls...think that look is making a comeback. A pleasant weekend is wished for you! shame about the stip mining. what we will do to our only home is beyond me. Nice picture (and music)! 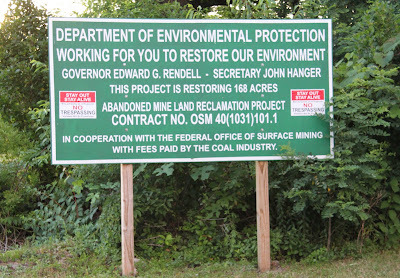 I'm glad they try to restore nature as it was before. Is that bottle on the ground empty as well? If the drink was alcoholic I hope Rose kept her balance on the hammock. Very nice photo. It looks like it could be my family sitting around outside because when you didn't have AC you hung out outside during the cooler hours. I can remember when the scarves were the style of the day. This looks like such a warm and loving group. Love the photo. I love it Kim, and I love the way the story keeps being updated. It is one of the things I most enjoy about posting old family photographs, the way the attract (like some sepia magnet) additional information which puts our own family history in better focus. Don't leave it another seven months before you return! The landscape looks so bucolic in your photo. It must have been depressing when it was strip mined. It definitely looks like a relaxing summer afternoon. What a treasure. And I'm glad you found out more information so that you could update the post. That's the joy of discovery! Thanks for sharing it with us! I love these casual photos even better than the fancy posed ones with serious expressions! It shows a true slice of life. So many wonderful things...the hammock, quilts on the ground, rockers...it is all the wonderful things of summer in one photo. Very cool! Such a wonderful summertime relaxed image.